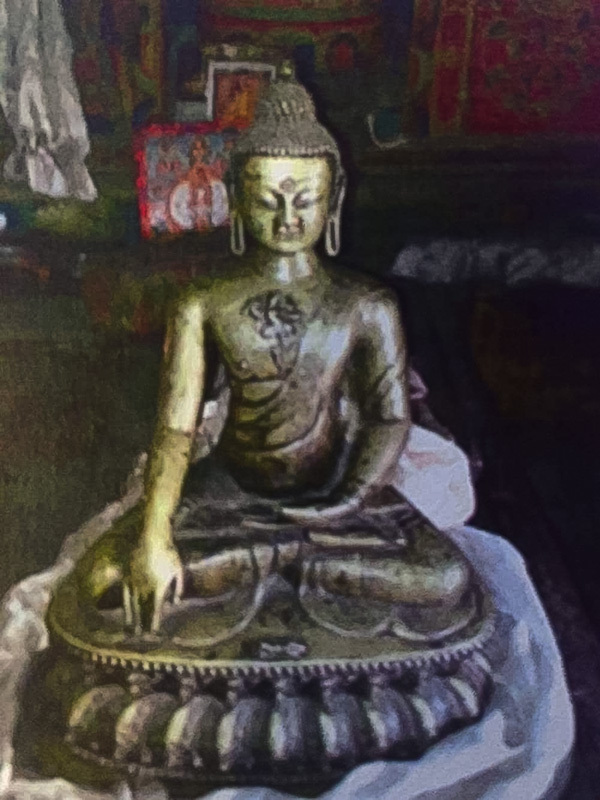 On the evening of April 10th, at about 11 pm, several armed thieves stole four statues and an illustrated pecha (loose-leaf Buddhist scripture with wooden covers) from the house of the caretaker of Gakar and Mekin gompas in upper Dolpo, Nepal. Two of the thieves have since been apprehended and three of the four statues stolen were recovered. However, the most precious and important of the sculptures is still missing, and may be in the Kathmandu area with one of the other members of this gang. This 16-18 inch bronze Shakyamuni statue, dating from the 15th century, is unique in that at its heart, there is a clear self-arising image of Machik Labdron - about 3 inches high. The statue contains the heart relic of the 4th Gakar Rinpoche. There is a single Dorje on the lotus in front of the Buddha. Anyone with further information about this sculpture should contact the editors of asianart.com at ; and/ or Lucy Needham at . If in Kathmandu any information can be reported to the police by calling +977 9858305555 or +977 9851280375. Also please call Gakara Tulku's relative Lama Dorje at +977-9803343812. Please distribute among all collectors, dealers, and curators you may know. You can download a pdf of this page as well for emailing.